Wristwatches are one of our favorite gadgets. We have acquired a few of them over the years, but we are always on the lookout to add to the collection. It is not always clear what will catch our eye: maybe the watch has some new and interesting tech, or is made from a cool material, or has a nice design, or has incorporated something novel. Whatever it may be, in order to make the grade, the candidate must have one or more of the following criteria: high quality, some unique feature, great value. Timex is making a series of watches on a technology platform which they have dubbed “Intelligent Quartz.” What is “Intelligent Quartz?” It is marketing-speak. But, it is also an apt description of what Timex is trying to achieve with this watch. This watch is able to tell more than just time, and does it within the design confines of a classic analog dial. It is a “smarter” watch in all senses of the word. An intelligent watch. Timex accomplished this with the addition of a fourth center hand, independent sub-dials that add advanced functionality, and unique complications to each watch as needed, all driven by the Intelligent Quartz (IQ) technology. We love the clean look of the this Timex Intelligent Quartz Fly-back Chronograph. Around the watch is a non-rotating black bezel with the hour indicators. The watch has a date window and two quarter dials, one at the 10 o’clock and the other at the 5 o’clock position. There are two buttons and a crown on the right side of the watch. 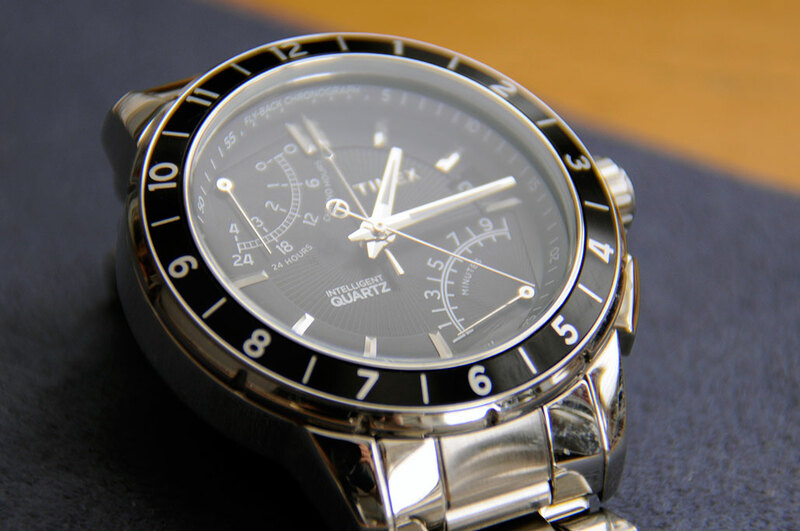 The watch comes with a linked stainless steel band secured by a security clasp. Like most Fly-back chronographs, this unit also has the start/stop button at 2 o’clock and the reset button at 4 o’clock. We have explained the utility of the fly-back function before, but will repeat it here for convenience: instead of having to push multiple buttons or a button multiple times, a fly-back chronograph will reset the second-hand with the push of a single button and restart the timing function. This is especially helpful for timing short-burst events that pilots, doctors, and racers/sprinters like to keep track of. Note that the fly-back function is different than a split-second function, with the latter essentially being a double chronograph. As frequent readers know by now, we cannot just leave things well enough alone. We are constantly swapping, changing, and replacing things. Watches are one of those things which we feel compelled to “upgrade.” Sometimes because they needed it, other times just to see. Maybe it’s because there are so many options available. Maybe it is because it’s so easy to do. We are not sure, but we do know that we cannot NOT do it! The same is with this Timex. 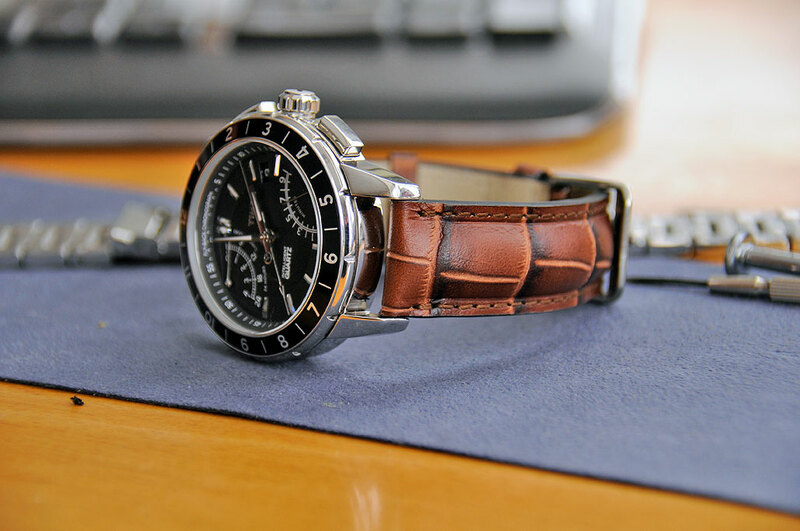 While we like the stainless steel band that came with the watch, we thought a leather one would give it a look which will complement another recent acquisition. The leather band is from the folks at StrappedForTime. For watch-related accessories, they have been our go-to source for years. We keep going back because they are tops in both selection and service. We are quite pleased with how the upgrade turned out. 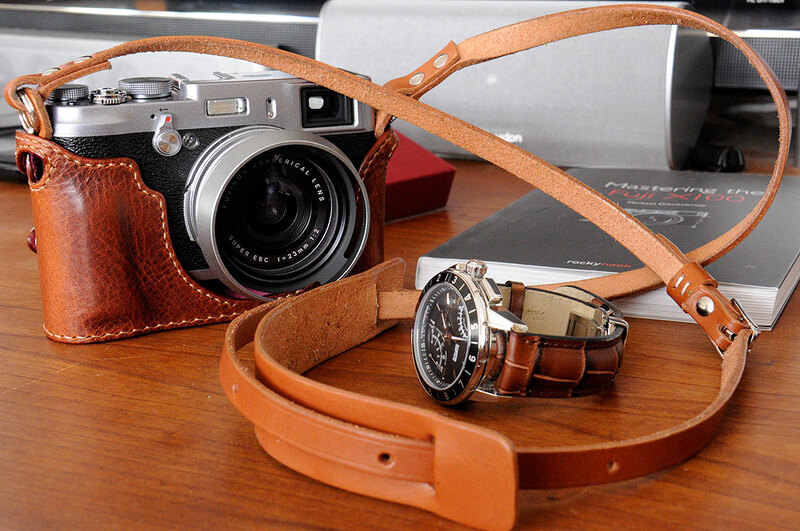 The leather band offers a warm contrast to the stainless steel case. However, we thought it needed something more. After some discussion, we decided perhaps adding a stainless steel deployment clasp would complete the package. It was the right call. The elegant clasp (closed, open) completed the transformation and will make an excellent pairing for the Fuji X100S camera. Classic is back!